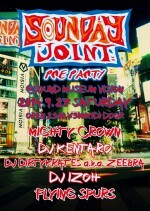 “SOUNDAY JOINT” is big outdoor hip hop festival. Last year, they featured Waka Flocka Flame, KID INK, AK-69, ANARCHY and more. This year, they will have this event on Oct 5th, in Sagami Lake Resort, Pleasure Forest. This will be pre-party at VISION. MIGHTY CROWN who is dance hall reggae group, DJ Kentaro who is former DMC World champion, DJ IZOH and more will be playing. This is great line up for pre party. Come on and check out what this party is about. Special “PARTY MONSTER” on the Day before Holiday. 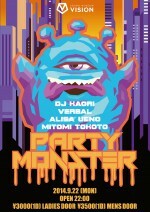 “PARTY MONSTER” is weekday party that makes Monday night in Shibuya more exciting. Their voltage goes up every party. This will be special version. They will feature great DJs such as DJ KAORI, VERBAL, MITOMI TOKOTO in GAIA. Other floors will feature many DJs to make exciting vibes. This will be their first climax! It goes beyond your imagination! 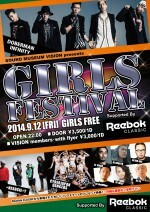 DOBERMAN INFINITY will be Live Guest for “GF”. The voltage of “GIRLS FESTIVAL” never goes down. They don’t care if summer is over. This is the most glamorous party at VISION. This time, they will feature DOBERMAN INFINITY as live guest. They were called DOBERMAN INC. At the time, it was only KUBO-C, GS, P-CHO. Now, SWAY, KAZUKI joined and became DOBERMAN INIFINITY in June. SWAY is also known as actor in TV drama and movie and theater. KAZUKI was selected as finalist in “EXILE Presents VOCAL BATTLE AUDITION 4”. They will rock the floor for sure. Check them out!